One trend I’ve been noticing with many of the twins, particularly the most famous ones, is that there always seems to be some sort of mention of twins, usually in a tongue-in-cheek manner. Mark already noted the “photoshopped” images of the Drake and Rihanna twins, then there is Justin Timberlake’s “secret half brother” and the Jennifer Lawrence twin sister sketch. So it’s not a surprise that there are similar stores regarding Hollywood party girl/hot mess Lindsay Lohan seeing that when she was a child she starred in the remake of The Parent Trap. Jackie Chan, Christian Bale, Jean Claude Van Damme, Jeremy Irons, Bette Davis, Edward Norton, Nicholas Cage, Armie Hammer, Eddie Murphy, Freddie Highmore, Adam Sandler, Hayley Mills, Danny Kaye, and Olivia de Havilland. All played themselves twice in the same movie using “CGI Magic”, supposedly. In de Havilland’s case they used “camera tricks” back in 1946. I propose that there is a high probability that all of the above actors are actually identical twins. Why else would this sort of plot be popular? The Parent Trap was cute, but who saw Sudden Impact and thought it was great? But I am not the first one to propose this regarding Lindsay Lohan, not at all. 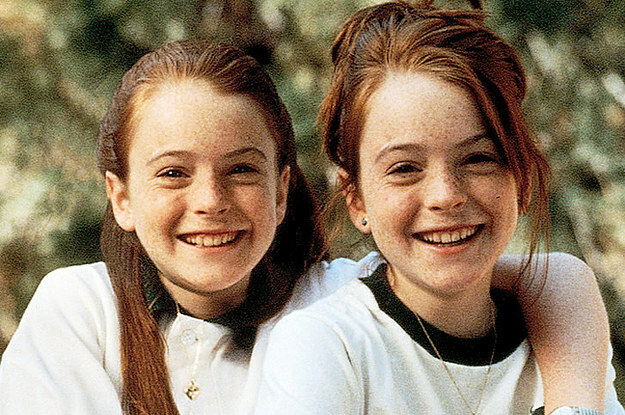 The conspiracy goes that Lindsay Lohan had an identical sister that appeared in The Parent Trap who eventually died. This is a common disinfo trope in conspiracy circles. Twins are never mentioned, only clones and only to say a celebrity died, went into hiding, or was “replaced”. It is never brought up that two twins may be playing the same character simultaneously. Very clever. They swap out the head of one of the Lohan twins and add this Erin Mackey instead who clearly looks different although somewhat similar enough to pass as a body double. Notice in the 2nd image how Mackey is pasted way back into the background. The right side of her face is far too dark compared to Lohan and the actors who played her parents. But is Lohan actually twins? What I did was take the two Lohans from the Parent Trap photo above and aligned them side by side. Since they were from the same photo, I did not resize either twin. Here is the result. If the “CGI Magic” was simply duplicating her in the same shot, we shouldn’t see any differences in facial alignment. You can see the difference in the alignment, and even in the photo from earlier. One twin has a round face, and one has a clearly longer face. I will show you that this stayed consistent as they aged. I give Mark credit for doing the work of identifying each twin. Here is Twin #1 with the round face. In my opinion, she is the more attractive of the two. And here is Twin #2, with the longer face who does a better job of playing the drug addict/court room/washed up child star. So there you have it. As always, Intelligence gives clues and is always rubbing it in your face. The arrogance is extraordinary, but not quite as extraordinary as the gullibility of the public. Posted on October 21, 2016 November 8, 2017 by straightfromthedevilsmouthPosted in Twins, clones, replicas? Actually, I think Twin #2 is more attractive. Not sure what I was thinking. They both seem to play the drug addict/party girl well. You’re right, drunk party girl is probably just an act – but just think, if she has to fake her death, they have laid the groundwork. She’ll hit a tree while drunk, and no one will question it, just as we did not question that Joplin died of a heroin overdose, as they had firmly planted it in our mind she was a user. Good job with the video of all of the supposed non-twins playing twins. I know I looked at Van Damme before, but he deserved another look. They can morph faces onto bodies, but there are usually telltale signs. By the way, another potential zombie before I forget – Michael Hastings. Probably too soon for him to re-emerge however. It has only been three years. Michael Hastings a zombie? Interesting idea. I assumed the story was true. Intrepid journalist “gets too close” to some truth and is killed by the powers that be. But a fake death is even more powerful–it has a chilling effect on LOTS of journalists. It’s similar to these “whisteblowers” like Snowden. His revelations and his exile are designed to make people FEEL like they are being watched and like whistleblowing will ruin your life. Just read your post on Duane Allman and my first reaction was that he resembled Oliver Peck from Inkmaster, a tattoo reality program. He is always throwing up the “rock and roll” sign every show. Curious similarities. Possible brothers? “Why else would this sort of plot be popular”? Why were twins popular in the nazi regime? Why did the nazi doctor study twins and do experiments on them? Why do you study twinning like they did?